Using the most recent results from the Kepler space telescope, scientists from UNLV and the SETI Institute, which searches for intelligent extraterrestrial life, have identified a new kind of planetary system. UNLV astrophysicist Jason Steffen and SETI scientist Jeffrey Coughlin have shown that there must be a population of planetary systems whose formation or dynamical history are distinct from their counterparts across the galaxy. The results of their study, A Population of Planetary Systems Characterized by Short-period, Earth-sized Planets, will appear in the Proceedings of the National Academy of Sciences. The key feature of these systems is an isolated, very hot, rocky planet. The best analogy, he indicated, is the population of hot jupiters — giant planets on three-day orbits that dominated the initial discoveries in the field two decades ago. Hot jupiter systems are widely viewed as having had a major difference in their formation and evolutionary past compared with other systems, and a variety of theories have been put forward to explain their origins. The number of hot earth systems is similar in number to the hot jupiters and may yield a similar advancement in our understanding of the processes involved in making planets. To identify this new group of planets, Steffen and Coughlin relied on the process of elimination. Starting with a sample of about 150 hot earth systems, they systematically tallied the number that could be from known origins – eclipsing binary stars, noise in the data, “typical” planetary systems, and other sources. The scientists noted a few existing theories that may explain the origins of these systems. They may be the leftover planet cores of hot jupiters, where the giant planet lost its large atmosphere to the central star. They may be the consequence of interactions between the planets and the last vestiges of the gas disk from which they formed. They may result from strong dynamical interactions from a newly formed system where the planet’s orbit eventually passes very close to the central star and is captured as its orbital energy is dissipated through tides. Or, they could come from some other process not yet considered. While the origin of these systems is not known, more information about them should be forthcoming. NASA’s Transiting Exoplanet Survey Satellite (TESS) mission, which is slated for launch within the next few years, should find many similar systems that can be studied in more detail using ground-based instruments. (Kepler targets are often too dim for such follow-up observations). As scientists learn more about these systems, the information gathered should provide additional clues to their past, and help researchers better understand how unique our own solar system is, or isn’t. Two scientists from the University of Nevada Las Vegas have suggested the existence of at least one super-Earth in the early days of the solar system located within the orbit of planet Mercury which ended up being devoured by the Sun. The region of space in our solar system between the Sun and Mercury is now barren, not even a rock is seen there. Scientists have long wondered about this “nothingness” and now they may have solved the mystery. In the new study* accepted for publication in the Astrophysical Journal astronomers explain that a super-earth, planet larger than Earth but smaller than Neptune, may be the responsible agent in clearing out the vast empty space within the orbit of planet Mercury. 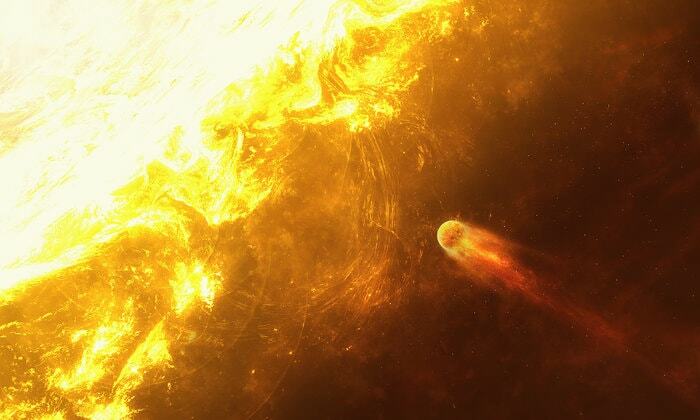 Over time, this hypothetical super-Earth must have formed near to the Sun sucking up all the debris in the area before plunging into the Sun and meeting a fiery death. said Rebecca Martin, an assistant professor at the University of Nevada. So they could have formed there sweeping up all of the solid material, but then later fell into the sun. The region of space in our solar system between the Sun and Mercury is now barren, not even a rock is seen there. Scientists have long wondered about this “nothingness” and now they may have solved the mystery. In the new study accepted for publication in the Astrophysical Journal astronomers explain that a super-earth, planet larger than Earth but smaller than Neptune, may be the responsible agent in clearing out the vast empty space within the orbit of planet Mercury. Since different systems may have different dead zone sizes, formation in the inner parts may not be possible in all systems and thus both formation locations may be operating. According to the authors of the study, at least one super-Earths formed in place and accreted the material inside of Mercury’s orbit, orbiting the sun around 10-100 million years after the solar system formed 4.6 billion years ago. Then the planet migrate towards the sun before finally being devoured by our star. The super-Earths could migrate through the gas disk and fall into the Sun if the disk was sufficiently cool during the final gas disk accretion process. While it is definitely possible to meet all of these requirements, we don’t expect them to occur in all systems, which may explain why the solar system is somewhat special in its lack of super–Earths.